I just posted a video for a great vintage hair pomade on my youtube channel, and thought it would be a good idea to have a set of written instructions as well. This pomade is seriously the best I've ever tried and love the look it gives my different vintage hairstyles. Pour the mixture into the jar and stir well. Fill the pot with some water then place the jar inside. The water level should reach an inch below the top of the jar. Slowly simmer the pot, while stirring the mixture, until the cocoa butter has fully melted. Then carefully remove the jar from the water. Add 10 to 20 drops of essential oil (if using). I opted for 10 drops of bergamot oil, to give my pomade a light scent, but you can use whatever scent you prefer. Add a label and voila! Fantastic homemade hair pomade! 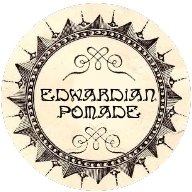 I've designed a free label for the pomade, using an actual vintage label as the base. Save the below picture, and print to size on label/sticker paper. Alternatively, you could print on normal paper and glue in place. If you use label paper, I would recommend doing a test run on normal paper first to make sure it fits your jar lid. This is such a marvelous recipe! I, as someone with super sensitive skin (especially on my scale and face), sincerely appreciate how all natural it is. Thank you so much for sharing this gem of an antique pomade recipe with us (I'm going to include it in my next "Links, Life, Love" post this coming weekend). Hi! Great video (and instructions). I was wondering if this is hard to wash off from hair? And do you think this is a high shine pomade? I've never had any trouble washing it out, but I never use a lot on my hair. I would think a good shampoo and the heat of shower should get most of it out without any trouble, even if you used a fair amount. It definitely adds quite a bit of shine, although I've only tried a few pomades over the years so I don't have enough to compare it to in order to say if it's "high shine" or just normal shine. Hope that helped. I enjoy all in your video!! I enjoy very much the vintage life!! We need to remember all antique life... I think it was better!!! Best regards from Mexico. I have a question, Ive made by your reciep but it doesnt become solid. I have added 10g of coca butter and 40 g of castor oil, and nothing happens :( What I have made wrong? Is that 10g/40g by weight? It should be a 1:4 ratio by volume. Measuring by weight could be throwing off the proportion of the oils. Also is your cocoa butter solid at room temp? Cocoa butter melts at around 35 C, so if you live in a very warm climate it may be too warm for the pomade to solidify. If that's the case, putting it in the fridge may help. Just curious if I could swap out the Cocoa butter with Shea butter. Would that make the consistency different? Yes, it would likely make a big difference to the consistency. Cocoa butter is very hard and brittle at room temp, while shea butter is softer and more spreadable. I like shea butter but I don't think it would be a good swap in this particular recipe.